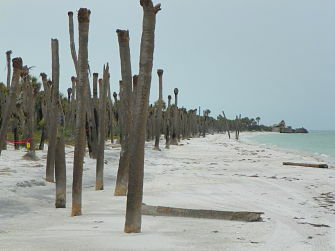 The greatest threat to Egmont Key is the loss of habitat due to erosion of sand mainly on the west beach. In the1850's a survey estimated the land area of Egmont to be approximately 580 acres and Passage key to be about 100 acres. 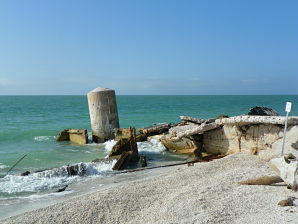 Currently, Egmont is about 250 acres and Passage Key is nothing more than a sand bar at low tides. 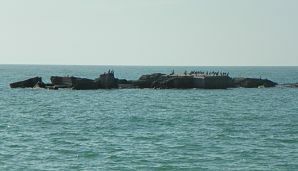 Batteries Page and Burchstead which once had 100 yards of sand in front of them, now are 100 yards off shore and is a snorkel/dive site. The Power Station which was once in the center of the island is in danger of being surrounded by water. 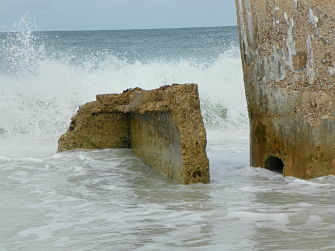 Other structures on the island have been damaged in the past due to the erosion problem. 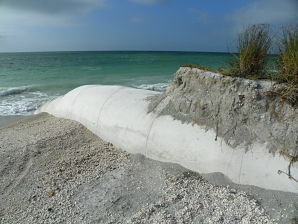 Get involved in the effort to Save Egmont Key! Go to http://saveegmontkey.com and find out how you can get involved. 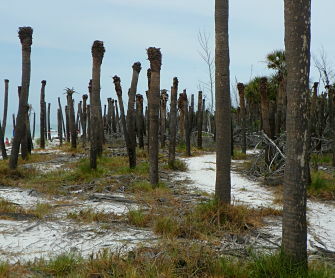 Below are some photos that show the extent of the loss of beach on Egmont Key.